Three remarkably accomplished young musicians come together in T’Monde, the Acadian phenomenon that Offbeat Magazine has called “a creative fusion of classic country and out-of-the-way Cajun.” With a combined 10 GRAMMY nominations between members Drew Simon, Megan Brown, and Kellii Jones, T’Monde brings influences ranging from early Country music to ancient French and Creole ballads to present day Cajun music. Born out of friendship and a shared love for the music, T’Monde has developed a unique sound that is unmatched in Cajun music today. With their latest album, “ Yesterday’s Gone”, the band showcases their influences and musicanship which makes their sound so special. 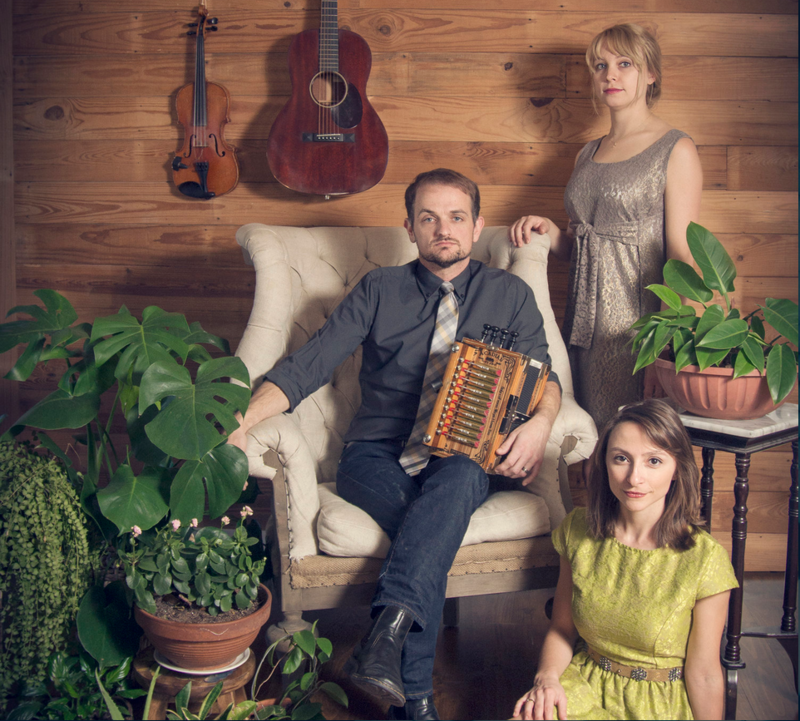 Drew was born and raised in Lafayette, Louisiana and developed an interest in Cajun music in his late teens. At 20, he began playing the accordion and started learning the words to many of the songs in his huge Cajun music repertoire. Although not owning his own accordion until he was 25, Drew has been a go to guy for many Cajun bands in need including Balfa Toujours, Jesse Lege and the Lake Charles Ramblers, Les Bassettes, The Lafayette Rhythm Devils, Paul Daigle and Cajun Gold, High Performance, and the Savoy Family band to name a few. He is deeply influenced in his style of music by dancehall legends Walter Mouton, Aldus Roger, Jesse Lege, Belton Richard, and Lawrence Walker. Fluent in french, Drew has been blessed to travel the world playing and teaching for the past 10 years as drummer/vocalist for the GRAMMY nominated Cajun band, the Pine Leaf Boys. This is the first song I ever learned how to sing. The singing is some of the most powerful and soulful of any Cajun singer ever. This version was the first song I ever sang on stage when I was 17 years old. The Balfa brothers and Nathan Abshire was some of the best musicians to every play together. This was probably the first song I ever heard Marc Savoy play the accordion on. Ive always loved his style of playing. One of my favorite songs to sing and play. No accordion player in Louisiana can say they haven&apos;t been influenced by Wayne Toups a little. If they say they aren&apos;t, they&apos;re lying. The first time I ever met Warren Storm, I was probably around 10. He was friends with my Grandfather. He was also one of the first drummers I ever heard sing. Probably my two biggest influences in music are Merle Haggard and Belton Richard. Naturally I couldn&apos;t leave this song out. This has always been my favorite Cajun waltz. In my opinion, pairing the voice and the lyrics, it doesn&apos;t get much better. A great musician told me one time, " Simple is always best." This song is not very flashy, but the words are killer. In my opinion the second verse is one of the best written in all of Cajun music. One of the greatest accordion players who has ever lived. Pair that with Ken Smith on fiddle, this song is insanely awesome. Megan, originally from Tepetate, LA, grew up to the sound of Cajun music at her grandparent’s Cajun restaurant. Singing all her life, Megan took to Cajun music and with it the French language at the age of 18. Joining first with her accordionist brother, Briggs Brown. Megan then went on to play with many different groups, performing at many cultural events, including Festivals Acadiens et Creoles, Folk Roots Balfa Camp, the Breaux Bridge Crawfish Festival, the Shreveport Mudbug Festival, and many more. I love this song. I love the tone of Eddie&apos;s voice and these three guys make up a great trio. It&apos;s simple, clean and grooving. Harmonica! We so rarely hear the harmonica in Cajun music. I wish it still had more of a place in the music. It&apos;s such a nice alternative to an accordion. Easier to transport too! Shirley is one of my favorite singers. He&apos;s got some of the best melodies, but his lyrics are great too. He doesn&apos;t use your typical "Ça me fait du mal" lyrics. So if you&apos;re looking for some new vocab, that&apos;s a good place to start. Cajun music isn&apos;t just Cajun. A good musician is gonna learn/incorporate other genres of music if they like it and especially if other people want to hear it too. And Cajun musicians have been doing this ever since the emergence of the radio. This is one of my favorite examples by the King of Cajun Swing, Harry Choates. Another example of outside influences coming into Cajun music. I stumbled upon this record at KRVS. I had never heard anything like it in the Cajun repertoire. I love his Cajun Chet Atkins/Les Paul style. The “Jolie Blonde” of the band, Kelli Jones-Savoy has been playing fiddle since the age of fifteen and started out playing old time music in North Carolina, where she is from. In 2006 she moved to Lafayette, Louisiana to study dance at the University of Louisiana at Lafayette and learn Cajun fiddle as well. She has been living there since, soaking up the culture and playing with bands such as the Magnolia Sisters, Double Date (with husband Joel Savoy, Linzay Young, and Emma Young), her father Carl Jones, and many local wonderful Louisiana musicians, including members of the Pine Leaf Boys, the Red Stick Ramblers, Steve Riley and the Mamou Playboys, and her fellow band mates Drew Simon and Megan Brown. She has also traveled beyond Louisiana to perform and teach at festivals throughout the United States, including Ashokan Fiddle & Dance Camp, Augusta Heritage Center Cajun & Creole week and the Festival of American Fiddle Tunes. This is one of my favorite older recordings of a female voice in Cajun music. I also feel like the energy in this cut is undeniably infectious. In addition to being a really interesting Cajun waltz interpretation of the Kitty Wells and Red Foley duet "You and Me", this has such a sincere tone and that singing gets me every time! This is basically the recording and the man that made me want to sing Cajun music. Also, you have to appreciate that funky drum sound that sounds like they&apos;re just banging on a box.